I think this is intended for contouring based on the (pretty dinky) brush included and the matte finish, but I used it for an overall bronzing effect, and I was impressed with the natural-looking all-over glow it gave me (I kept thinking, "wow, I'm tan!"). One more interesting aspect that I surprisingly do not hate: It smells like coconut. The price is another plus. 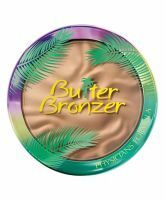 I really liked this bronzer! It gave my skin a nice warm glow, applied like a dream (when I used my brush, not that stupid rubber pad it came with) and lasted all day. It's a fantastic drugstore pick.